Dismantling of North Korea's missile launch site on its northwestern coast appears to have been halted since the middle of August, an American broadcaster reported Tuesday. Voice of America said that North Korea began dismantling key facilities at its missile launch site in Tongchang-ri, North Pyongan Province, in mid-July, but the process seems to have been suspended since about a month ago. 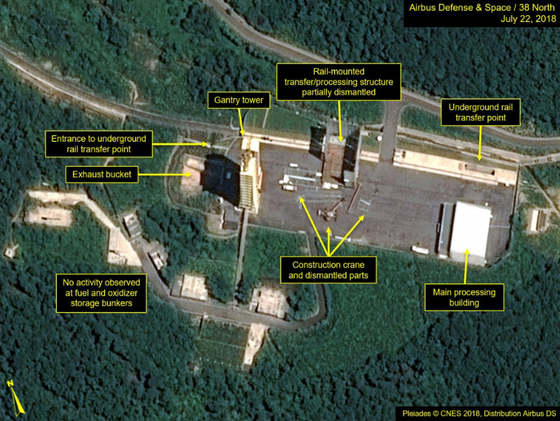 Citing data from Planet Labs that offers the Earth's satellite photos every day, the VOA said that there has been virtually few changes at the North's Tongchang-ri missile launch site from Aug. 16 to Sept. 10. In the same period, a missile-engine test site near the launch site has not shown any particular changes, the broadcaster noted. 38 North, a US website devoted to analysis about North Korea, has also said that its high-definition satellite photos didn't detect any particular changes at the Tongchang-ri site from Aug. 3-16, triggering speculation that the North has stopped dismantling the missile site. According to the VOA, a Stanford University analyst agreed to the view that North Korea has halted the dismantling and the Tongchang-ri site still remains workable because facilities destroyed in the initial stage were not considered key components capable of blocking a missile launch. Similarly, there still remain many buildings and facilities at the missile test site, according to the analyst. North Korean leader Kim Jong-un promised to destroy the Tongchang-ri site during his summit talks with US President Donald Trump in Singapore on June 12.